Does Boston need a bigger convention center? Do convention centers really do anything to improve the life of a city? Any city? Boston in particular? And is bigger better? Already, Boston is home to a behemoth of a convention center with 12 acres of indoor space. The building near the South Boston waterfront, designed by Rafael Vinoly, is only five years old. Four weeks ago, the Convention Center Authority held a press conference. It launched what journalists call a trial balloon. What if, proposed the Authority, we doubled the center in size? That way, we would be able to compete with other cities for the biggest conventions. All those conventioneers would need hotel rooms, restaurants, much else. They’d spend money. They’d bring economic growth to a part of the city that’s long been pretty stagnant. Boston’s convention center can’t do all those things. But the principle holds. Any addition should be thought of not as a deadly, single-purpose monolith, a vast pile of hotels and meeting rooms, but rather as a mixed-use neighborhood in which lots of different things happen, as they do in San Francisco and Philadelphia. It should incorporate shops and restaurants at its edges, where they can engage the neighbors, including pedestrians as well as conventioneers. 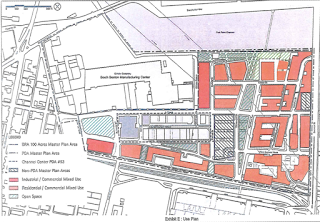 It should mitigate the inhuman vastness of its barren site by inserting some public streets. Good cities are made of good streets. The city should mandate these benefits. If the convention center accomplished some of that, it might even do good for the South Boston waterfront. So far, this huge new piece of Boston feels like a badly designed New Jersey office park. The streets are too wide (they’re highways in the city, really) and they are hopelessly disorienting. The signage is misleading and the buildings are too far apart to create interesting frontages. Who has ever taken a walk for pleasure in this part of Boston? Boston’s biggest selling points are its human scale, its walkability. Those are the qualities that attract visitors. Maybe a better convention center could bring some of these merits to a South Boston waterfront that needs them desperately.